The ideal complement to your visit to our beautiful country! Three exclusive and sustainable tourism operations have joined forces to offer you the unrivalled diversity of Ecuador in as few as 4 days!. Termas de Papallacta SPA & Resort, Cotococha Amazon Lodge and Luna Runtun, have designed custom packages to enjoy the best of continental Ecuador, the ideal complement to your visit to our beautiful country! We are all fully committed to the highest safety standards, to the sustainability of our fragile eco-systems through environmental conservation (being all certified by Rainforest Alliance and Smart Voyager) and to satisfy our clients entirely with our excellency in service! 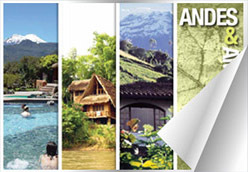 DISCOVER ECUADOR'S DIVERSITY WITH OUR AMAZING ANDEAN & AMAZONIAN ODYSSEY !